Posted April 4, 2017 by Staff Writer & filed under Arts & Entertainment, Theatre & Performance. The new Broadway musical by Brian Hargrove and Barbara Anselmi makes its Australian debut in this production by Chatswood Musical Society. 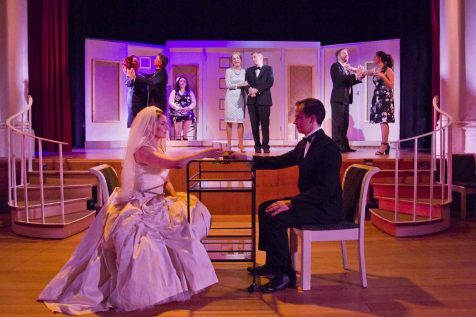 It Shoulda Been You is like a New York Jewish version of a Shakespearean comedy, with augmented personalities, absurd situations and quick, sharp dialogue. While it does have a lot of the predictable elements of a contemporary Broadway musical, it’s self aware enough for that to merely add to the humour. Chloe Angel plays the lead role of Jenny Steinberg, the elder of two Jewish sisters who is helping her younger sibling, Rebecca (Michaela Leisk) prepare for her upcoming wedding to Brian Howard (Dave Berry) – a gentile. Neither party’s parents are thrilled with the ensuing nuptials, and both mothers are less than subtle about their disapproval. Kate Mannix is wonderful as the loud, insufferable, exaggerated yet believable Jewish mother, Judy Steinberg. Her counterpart is Georgette Howard (Chapin Ayres), Brian’s stalky, martini swilling, cynical mother who sees the marriage as the final incision in the umbilical chord. Every character in the rest of the cast adds an element of colour and variety to the ensemble, with another notable mention going to Atha Kastanias as Albert the wedding planner. While he is typically camp, he has a presence and charm that makes him more than an ornamental character. The acting and singing are equally impressive amongst the cast, though Chloe Angel has some virtuoso moments. The show is being staged in the beautiful art deco Independent Theatre in North Sydney, which has generous seating but a comparatively tight performance space. Neil Shotter, set designer has dealt with this in a creative and resourceful way. Great orchestra, great production, great fun. Come and support your local theatre.